The explosion occurred in Bishop Street shortly after police received a warning. They were on the scene when the blast occurred. Officers had just started evacuating nearby buildings, including a hotel, when the explosion took place. A cordon has been set up at the scene. A firefighter at the scene said: “We have not yet been allowed near the actual scene of the blast yet, so we don’t know what the damage is. 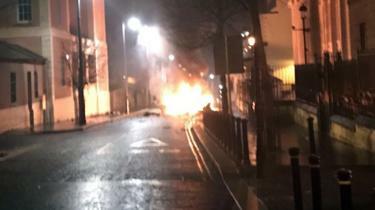 SDLP MLA Mark H Durkan has tweeted: “Whoever is responsible for this explosion outside Bishop Street Courthouse in Derry clearly hasn’t got the message that the people of Derry DO NOT want this on our streets. The DUP MLA, Gary Middleton, has described the incident as a “disgraceful act of terrorism”.